The story of Frankenstein’s monster has had many incarnations on screen, but perhaps none as clunky as I, Frankenstein, in which the stitched-up soulless creature is presented as a superhero of sorts.What’s particularly embarrassing here is the seriousness with which everyone concerned approaches this ludicrous plot.I’m going with one-and-a-half out of five for I, Frankenstein. It’s silly beyond belief; doesn’t deserve your time. If you’re a fan of the Kate Beckinsale-starrer Underworld series, Stuart Beattie’s I, Frankenstein is bound to entertain you. The graphics, action sequences and CGI are amazing. However, the film is more of a generic action-fantasy based on a graphic novel, rather than the book by Mary Shelley, so don’t expect it to be emotionally moving. Here, the character buildup takes a backseat and style supersedes substance. Overall, if you want to eat that popcorn and enjoy a horror fantasy, go for it. But if you want to revisit the legend of Frankenstein, watch the 1931 classic again. There is a certain lethargy that sets in early on in the film. You can predict the entire plot 10 minutes into the opening scene. The fight sequences and big moments seem heavily inspired and borrowed from recent super hero flicks. 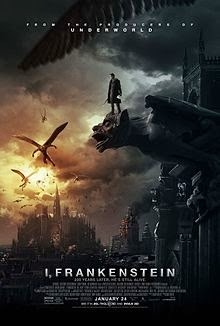 Trying to hard to fit into either the horror or thriller genre the film fails on retaining our interest as we drag ourselves into a tedious second half.Mildly entertaining, I, Frankenstein fails to raise a scare or keep us on the edge of our seat.